Growing your own fruit is rewarding and good for you. Not only do you get the opportunity to care for and nurture your own crop, but you get to eat tasty, vitamin-packed fruit from it too. Unlike many vegetable crops, most fruit crops require very little attention from the grower, so are fantastic if you have little time, or space. Many fruits grow on trees, where you simply plant them in the ground and wait for them to produce fruit, or on bushes, which grow naturally and produce an abundant crop every year. Apple and pear trees can be grown in orchards, large pots, or trained as espaliers along a wall or trellis. If you want to grow your own apples and pears you will need at least two trees so they fertilise each other and produce more fruit. There aren’t many flowers in bloom in early spring when the apple trees are in blossom, but it’s a good idea to plant primroses and rosemary in your garden to attract early bees and other pollinators, who will pollinate your apple flowers and increase your yield. There are self-fertile varieties, however, such as Jonagold, if you are short of space. Blackberries and raspberries are perennial plants (they live throughout the year) that bear fruit on biennial canes (every other year). They enjoy a fairly large growing area and prefer a sunny situation, and they’ll produce more fruit as a result. The plants grow as brambles, so they also make a good security hedge, but they will need pruning, or cutting back once a year so they don’t grow out of control. It’s best to plant them in early spring, in well-cultivated, free draining soil. 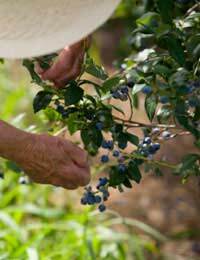 Mulch the soil around the stems with straw or garden compost once a year and you should be rewarded with a healthy harvest of tasty berries for years to come. These mini fruit trees prefer an acid soil, so are best grown in pots in ericaceous compost and fed with rain water (tap water contains lime, which they hate). They provide visual interest nearly all year round as they flower in spring, fruit in summer and have spectacular foliar displays in autumn. The fruits are delicious and if you buy several plants you can get blueberries from early summer right through until late autumn. They prefer full sun. Currants and gooseberries are cold hardy (they survive the winter months), easy to grow, and their fruit makes excellent jams, jellies, preserves, and pies. The two types of fruit tree have similar growing requirements. They prefer cool, moist, well-drained sites. Red Lake – plants produce clusters of large, red berries with a mild flavour. White Imperial – has medium to large berries. Fruits are white with a pink blush. Strawberries suit growing in a bed or in pots, and you can buy special strawberry pots to grow them on your patio or balcony. They prefer full sun. If you are growing them in a bed, mulch the ground with straw to prevent slugs from eating them. If the growing fruit rests on the straw it will also prevent it from rotting. Keep the soil free from weeds and consider using netting to keep birds of your precious crop. Growing your own fruit is incredibly rewarding, and much healthier too. Start off with a few strawberry plants and watch our fruit garden grow. @salfordscouser - while there could be a number of usual reasons why your tree hasn't fruited, it seems odd that one has and one hasn't even though they are getting the same treatment. Overfertilization is one of the most common causes of reduced flower production, however I imagine you are treating both the same. Sometimes bad planting can be a cause, especially if it is planted too deeply. Replant disese could also be a contributing factor if a young tree is planted in the same location as an old tree which may have been diseased. Obviously soil can play a bit part, but I don't imagine the ph is very different between the two. I can only think that when fruit trees that are planted too close to one another they can compete for nutrients and light. Perhaps you could try to ensure the unflowering tree is getting enough nutrients from the soil. I plated a pair of pear trees 10 years ago. They are both trained as espaliers on the same south facing wall, well separated and growing equally well. Both receive the same treatment Flowers and fruits well One never produced flowers. Any suggestions? I have grown an apple tree from a pip. I want to keep it in a container, what is the best compost to use? Wish I had read this before I planted my poor fruit trees. This time I will have healthy trees and fruit. Have shared on facebook, love the advice, thank you.